Hi! Today I am playing along with the CAS Colour and Sketches Challenge #197 – a sketch challenge! CAS stands for Clean and Simple – something I struggle with – so I thought perhaps if I did some of their challenges, it might help my CAS cards look better. I thought the holly would work well for the sketch this week. 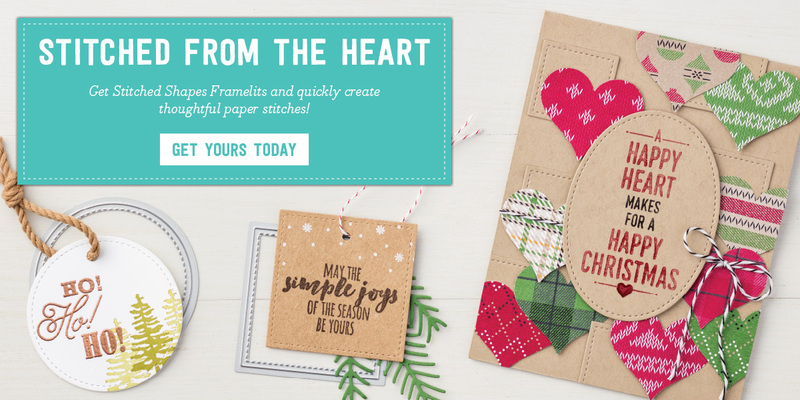 I love holly and couldn’t resist this bundle from the Holiday Catalog – you get both the stamp set AND the coordinating punch! My colors are Cherry Cobbler, Garden Green and Very Vanilla. I thought a softer white would be better. Thankfully, we had a frost last night – which was perfect for today’s card! I also have an exciting announcement! Today YOU can purchase a sneak peek item from the 2017-2018 Annual Catalog!! A set of stitched framelits are being offered for the month of November! I LOVE the look and can’t wait to order mine! AND – to add to it, Stampin’ Up! is offering select coordinating stamp sets for 25% OFF as well!! How awesome is that! Wonderful card! Love the fun stripes with the hand-drawn look of the holly. Thanks for playing along with us at CC&S! Love that shade of red on your stripy paper, fab contrast with the holly green. Thanks for playing along at CC&S.